Although solar energy is a green technology with many environmental benefits, we understand that this decision must make financial sense to you. That’s why we take the time to know the best manufacturers of the highest quality components at the best possible prices. There are options with as little as $0 down and under a $100 a month. Be sure to ask about the PACE program and upgrade without a credit check. Be sure to ask about the PACE program and upgrade without a credit check. The homeowner loans money from certain municipalities (city, town, county or state) and pays back through higher property taxes over 5 to 25 years. 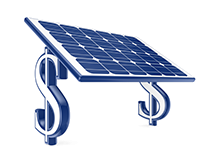 What is the difference between solar leases and power purchase agreements?